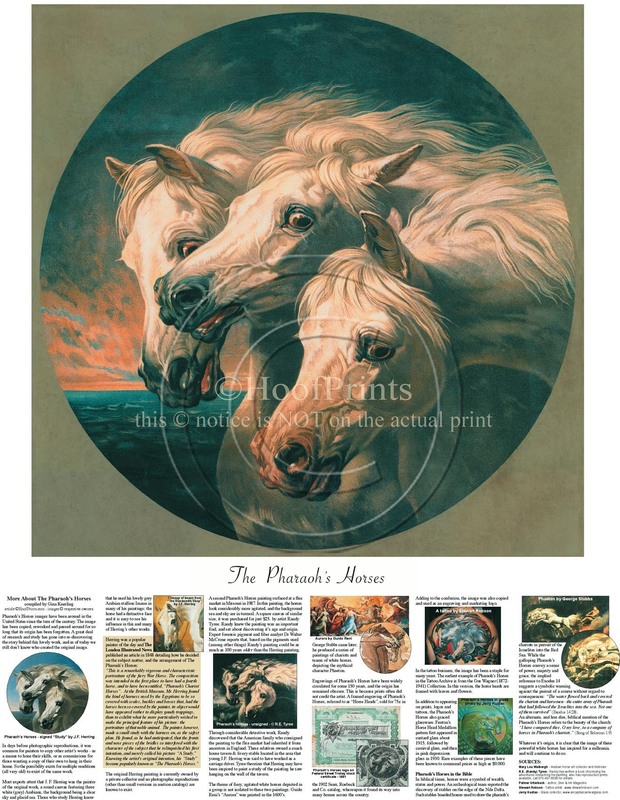 Printed on high quality, heavy paper, the size of the actual image of the 3 horses is 15"x15" - it's a circle with the brown square surrounding it as shown. The overall paper size including the article at the bottom is 20"x26". The image of Pharaoh's Horses has been popular for many years. There are many different reproductions out there - both old and new - the original artist is not known for sure, even after much research. This print is a reproduction of an old engraving (origin unknown). At the bottom, I've added an article that I compiled as the result of my research, outlining some interesting details about the print, and featuring 11 small color pictures illustrating key points. This is for entertainment purposes only, it's the best info I could find from a myriad of sources - and it's intended to be trimmed off before the print is framed or displayed. For larger image click here. When I first located this color version of an old favorite print, I was disappointed that I could not pass along a little more info about this lovely picture - it's been around for ages and many of us remember it from childhood times. Well, I did some more searching, and came up with a fascinating story (and then some). Did I find it with the JF Herring estate? an art historian? perhaps a horse art guru? No. "In biblical times, horses were a symbol of wealth, status and, in warfare, power. A joint German-Egyptian archeological team has reported a discovery of horse stables, which housed over 400 horses, on the edge of the Nile Delta. The stables have been linked to pharaoh Ramses II who ruled more that 3,000 years ago. Such stables presumably boarded war horses similar to those used to draw the pharaoh's chariots in pursuit of the Israelites into the Red Sea. While the galloping steeds of Pharaoh's Horses convey a sense of power, majesty and grace, the implied reference to Exodus 14 suggests a symbolic warning against the singular pursuit of a tragic course without regard to the consequences: "The water flowed back and covered the chariots and horsemen-the entire army of Pharaoh that had followed the Israelites into the sea. Not one of them survived (Exodus 14:28)." "The Arabian stallion which Herring used as his model in so many of his paintings was named Imaun, named after the Imaun of Persia, who gave him, along with three other purebred Arabs, to Queen Victoria. The Queen thought, quite sensibly, that Imaun might prove to be too much horse for her, so she gave him to her Chief Clerk. This man immediately (showing great tackiness) sold him at Tattersall's, the famed horse sales establishment which is in business to this very day. Herring bought him and kept him all the rest of his very long life. His first idea was to use him as the horse model in a series of paintings he planned around the hero Mazeppa, who tied himself to his horse, so Herring hired a trainer to train Imaun to lie down, to be "housebroken," etc. This trainer said that Imaun was the most brilliant horse with whom he had ever worked, and Herring loved him so much that it is quite possible to pick out the horses he painted using Imaun as a model, because of the love and care taken with every stroke of the brush. Imaun is all three of the heads in The Pharoah's Horses, his head is on the big grey work horse in his painting of The Blacksmith Shop here (The woman standing in the scene is Herring's daughter, Jenny), he is in the two paintings Herring did of Mazeppa, and in countless others." I have seen old versions of this picture go for a lot of money on ebay - they are not particularly rare - so in this instance it's probably a better bet to buy a NEW one that's in perfect condition!